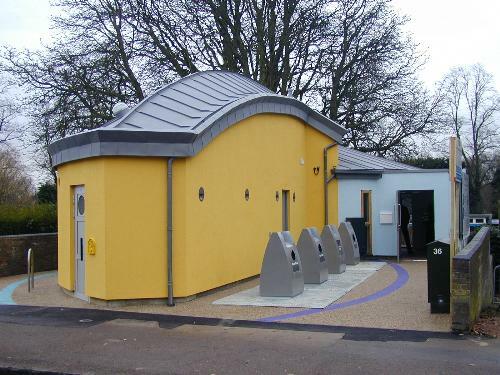 The third toilet block (public convenience) designed by the architects for the city, the first being at the edge of Parker's Piece and the second at the edge of Midsummer Common on Victoria Avenue. The main architectural feature of this one is the roof, which is zinc over timber. There are four toilet cubicles: two "standard" ones; one which provides disabled or "carer and baby" access; and one which is allegedly for females only (it's hard to see how that is going to be enforced). The female-only cubicle is just visible at the front of the building, and the entrances for the other three cubicles are behind on the left side of the building. One of the two "standard" cubicles was not ready when the toilets officially opened on 22 December 2008. The building has a one-room office at the back (so, the section painted faint blue), overlooking the river Cam, and including a balcony. But, in true Cambridge style, there is no car parking available, making the office much less attractive to most businesses. Outside there are four underground recycling points, each with a stainless steel, and hopefully vandal resistant, chute, as seen in the photo. In addition rainwater is harvested from the roof and is used in the flushing of the toilets.